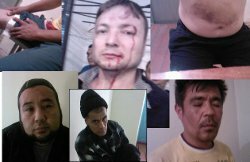 Kyrgyzstan: Who’s gonna rescue the victims of “ethnic tortures”? Since June 14, 2010, the France-based Association of “Human rights in the Central Asia” has received a huge amount of complaints filed by citizens of Kyrgyzstan of Uzbek ethnic origin, reporting all kinds of violation of their rights committed by the law enforcement and investigative bodies. As a result of an over year-long monitoring activities, the association has compiled a list of tortured victims, convicted under some fabricated indictments. The Fergana news agency has published this list on the occasion of a visit of Juan E. Mendez, the UN special rapporteur on torture, into Kyrgyzstan. A review of cases conducted by the Association of “Human rights in the Central Asia” has shown that many of the tortured victims have been convicted pursuant to the following articles of the Kyrgyzstan’s Criminal Code: Article 97, entitled ‘Murder” even if no murdered person has been identified or no corpse has ever been found; Article 233, entitled “Mass riots”, even though it has not been established that convicts were involved into riots or were found to be some place else, as well as articles168 (“Robbery”), 174 (“Intentional breakage of property’), 241 (“Illegal possession of firearms and ammunition”), 366 (“Concealment of a crime”). Numerous complaints by victims of tortures and those convicted pursuant to fabricated charges filed with relevant public authorities have been left without consideration. Some of the most insistent complainants have been intimidated and forced into abandoning their petitions. Ethnically Uzbek citizens continue to be treated biasly by the court and investigators. While all parties to a conflict may have committed similar crimes, the courts tend to punish Uzbeks in the most severe way. Frequently, courts ignore testimonies made by defense witnesses, found to be ethnically Uzbeks. According to conclusions made by the Associations, effective defense by attorneys is not possible due to threats from plaintiffs and their relatives. The Association’s experts have identified 15 criminal cases, in which ethnic Uzbeks from the south of Kyrgyzstan have been tried by the court of law. These cases manifest the political nature of indictments and disclose the characteristic features of ethnic discrimination. Some of the convicts are young men, sentenced to life terms, and even mothers that have many children. Unable to count on a fair trial, these people believe only in the international public pressure to give them freedom. Judicial board on criminal cases of the Osh province court is considering an appeal filed by Mirzakhid Vakhabdjanov. October 14, 2011 Osh city court sentenced him to 16years in prison. Vakhabdjanov was accused of involvement in the riots in southern Kyrgyzstan in June 2010 and attempted murder. At all stages of this case the principle of fair and thorough investigation has been violated, as well as the right to a fair trial. Vakhabdjanov’s case requires immediate intervention of the international community. Vakhabdjanov Mirzakhid Bakhodirdjanovich was born in Osh, on August 18, 1976. He is an ethnic Uzbek, a citizen of Kyrgyzstan, entrepreneur engaged in the business of car repairs. He is married and has three children. He has no previous convictions. Like many Uzbeks he suffered damage during the pogroms. His house was destroyed; his car and car repair shops were burnt down. Loss of property was documented by the financial police. June 20, 2010 Mirzakhid Vakhabdjanov and his brother were detained by police on suspicion of attempted murder of Zholdubay Zulpukarov at 24 hours on June 10, 2010 near the province children's hospital. After a confrontation with the victim a criminal case was initiated against Mirzakhid Vakhabdjanov. From the testimony of Mirzakhid Vakhabdjanov it follows that about 10:30 June 10, 2010 his wife woke him up. She said she heard gunshots and that a crowd of armed men was moving down Central Street where they lived. Therefore, all residents of Mahalla, including Vakhabdjanov with his family, began to flee deep into the Mahalla and headed to the Kalinin collective farm, where they stayed until morning. At the same time Vakhabdjanov woke up the neighbour Mavlyuda Mamadalieva, who had small children, and helped her carry the child. He then ran to the house of a helpless neighbour Khidoyat Haydarova who was over 80 years old. On his hands he carried her to the collective farm named after Kalinin. Returning to the mahalla next morning Mirzahid saw that all dwellings in his street were burnt down including his own house. He returned to Kalinin collective farm where neighbours were hiding. Together with them he was there until June 16, 2010. Trying to get a confession in the assassination attempt of Zulpukarov, operational police officers have used illegal methods of duress on Vakhabdjanov: they beat him (injuries reflected in the photo), threatened to bring charges of murder he did not commit. Defence attorney reported this to the General Prosecutor, who ordered the Osh city prosecutor's office to check the fact of the use of torture. Prosecutor's Office already knows the name of the investigating officer of the Osh city Office of Internal Affairs, who caused Vakhabdjanov’s injuries. So far, however, he had not been brought to justice. Originally the criminal case was considered by the Osh city court judge A. Akyev. The court session was attended by observers from the Office of the UN High Commissioner for Human Rights, a correspondent for the Radio "Azattyk", local human rights organizations “Ray of Solomon”, and “Advocacy” Human Rights Centre. Among the criminal case materials there was a forensic report No. 1871 on J.Zulpukarov (forensic expert S.T. Toktomametov). The document stated that on June 10, 2010 at 24 hours in the Children's Province Hospital Zulpukarov was beaten by unknown assailants and was injured. He had a closed head injury, bruised wound in the left superciliary area and bruises on his neck as well as a stab wound in the left gluteal. At the hearing defense presented an excerpt from Zulpukarov’s history of disease issued in September 2010 by the doctor of the neurosurgery department of the city hospital Sh. Zuparov. He did not record that Zulpukarov received stab wounds in the left gluteal area. Defence provided a copy of the medical emergency card filled by doctor Rismatova, which did not contain a record of that stab wound. The court only listened to the testimony of the forensic expert Toktomametov. Defence attorney Tatiana Tomina filed a motion on questioning physician Zuparova, emergency doctor Rismatova, and an independent judicial expert. The court dismissed the petition without grounds. Defence verbally challenged the trial judge, but judge dismissed the court challenge. The Court did not consider the discrepancy between the results of forensic examination and discharge from the medical history and sentenced Vakhabdjanov to 15 years in prison. Osh province court dismissed the appeal against the sentence of the City Court and upheld it. April 28, 2011 the Supreme Court held a hearing on the oversight complaint against the sentence, which entered into force. The Supreme Court issued a decision to revoke the sentences of the first and second instance courts and remanded the case for a new trial in Osh city court. October 14, 2011 hearing ended at Osh city court (Judge T. Aibatiev). Doctor Zuparov was summoned to testify in court. He said that when filling up the records of medical history he made ​​a mechanical error and omitted the presence of physical injury - stab wounds on the left buttock. 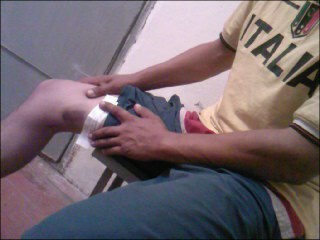 The doctor gave the court a copy of the medical history, which had an added entry about a bruised ragged wound. Defence attorney filed a motion requesting to hear the ambulance staff who hospitalized Zulpukarov and to assign the second forensic examination. In violation of the Code of Criminal Procedure the court dismissed the petition without the possibility of appeal against the decision on rejection of the second forensic examination. Vakhabdjanov was sentenced to 16 years in prison. The Supreme Court in its decision noted the contradiction between the forensic medical examination and an excerpt from the medical history and ordered this to be rectified. Instead, the city court increased the sentence. After that the defence attorney discovered that the extract from the medical history said "bruised lacerated wound in the gluteal area” while the original medical history records read “bruised wound with occasional bruised lacerated patches”. Defence attorney pointed to these discrepancies but the court did not take it into account and did not conduct an objective and complete investigation. The victim Zulpukarov constantly changed his testimonies. At the confrontation in the courts of the 1st and 2nd instances, he said that Vakhabdjanov approached him in front, embraced and stabbed in the buttock. After the case was returned from the Supreme Court, Zulpukarov changed his testimonies. He argued that Vakhabdjanov approached him from behind, and he did not see the defendant, but could only hear his name called. There are no witnesses of the beating of Zulpukarov. The court judgement is entirely based on his verbal testimonies and the conclusion of the forensic medical examination. Evidence provided by the defence attorney is not taken into account.